Don Wheeler was a teenager in the 50's thats when Elvis and Bill Haley and the Comets started rocking the music world.Things sure have changed a lot since then. He started out playing guitar in a rock n' roll group and never started singing for years because it was too scary for him. But once he started singing he started his own group and took it on the road. They toured all over canada and that was when the fun began. Since then he learned to play keyboards, bass guitar, drums and harmonica and always had a 4 or 5 pc group. Don then joined a group called Jack Bailey and the Naturals. They then headed to New York City to do some studio recordings. They recorded at least 9 or 10 singles in 3 days with background singers a baratone sax, keyboards, bass, drums and guitar. Since then, most of those guys have passed on due to illness etc. 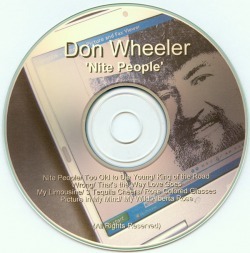 Don has sold numerous cd's in the bars he has played. He is now back to his country roots and his cd contains half of his origionals as well as some cover tunes. The biggest highlight of his career was when he met a few stars on the road like the Everly bros., Buck Owens, Frankie Laine, Lou Rawls, Johnny Rivers and Mel Tillis who he found the most down to earth.